Read below article to learn how to use the updated iFonebox 2 for Mac. 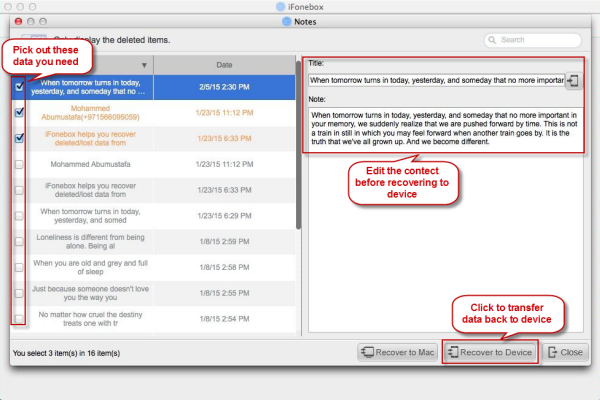 iFonebox 2.1 for Mac is a superb iOS data recovery software for Mac users to get lost or deleted data either from iOS devices iPhone, iPad, iPod, or from iTunes/iCloud Backup file. Tips: If you use an iPhone 4/3GS, iPad 1 or iPod Touch 4, you will see the following interface which allows you to enter the "Advanced mode" to recover data. 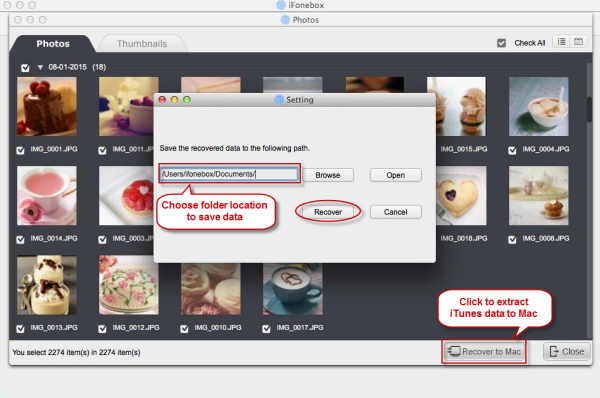 All the data categories supported by iFonebox for Mac are displayed in the interface. Just click on the icon of the data you want to recover and the software will automatically start to analyze and scan it. When the scanning is finished, you can preview all contents of the selected data, including these deleted one. (Contacts, Messages, WhatsApp, Call History, Notes, Calendar, Reminders and Safari Bookmark) You can tick any items you want and store them on your computer by clicking on the "Recover to Mac" button. If you want to preview other data, just click the "Close" button to exit from the current interface and click other icon to view other data. iFonebox 2.1 for Mac can also help you extract data from iTunes backup which allows you to preview photos, videos, contacts, messages, whatsapp, and voice memos etc from your iTunes Backup without the limitation of file format.Note:Don’t sync your device with iTunes when you realize that you've lost data, or the iTunes backup file will be updated after the sync, and the lost data cannot be recovered any more. Run iFonebox 2.1 for Mac on Mac, Choose "Recover from iTunes Backup" on the main interface. All the iTunes backup files of your iOS Devices which have been created with iTunes on this Mac will be automatically found and listed here. You can choose the one you want and click "Select" to access the data interface. Tips: If your iOS device backup is not displayed here, it's probably because your iOS device has not synced with iTunes on this Mac or you have saved the backup in other locations. You can click "Select more" button to locate the backup file by yourself. Then you will enter into the interface showing you all the data categories from your backup file. Select the data you want to recover. 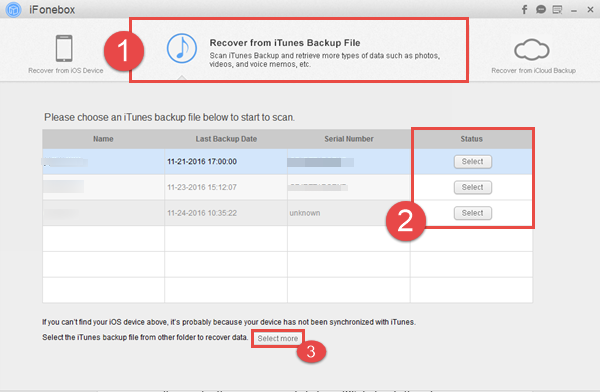 The scanning time depends on how much data are included in your iTunes Backup. You can preview them one by one before recovery. When the scanning is finished, you can selectively recover those you want by clicking the "Recover to Mac" button on the bottom-right to save them on your computer. 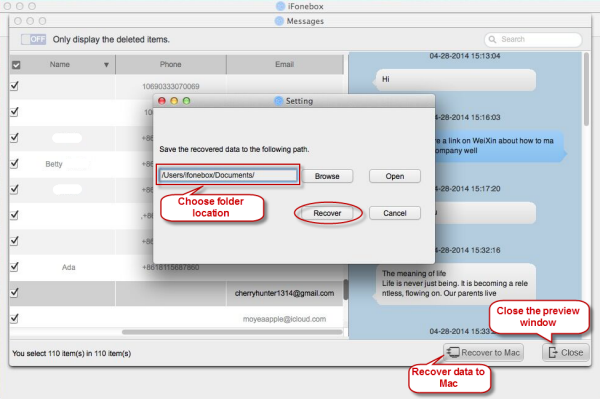 Run iFonebox 2.1 for Mac and choose "Recover from iCloud Backup" as the recovery mode. Then you'll see the window below. Enter your Apple ID which is involved with iCloud to sign in. 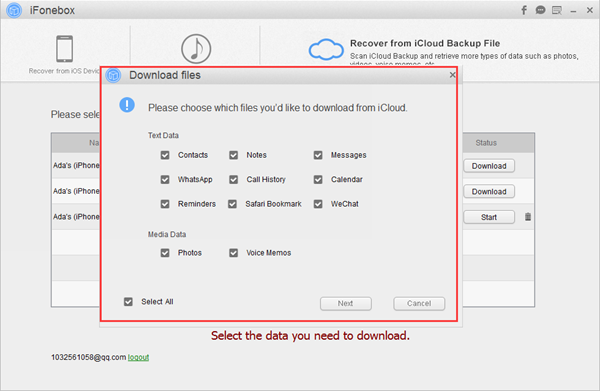 After you log into iCloud, the program can find all iCloud backup files in your account. Choose one from which you're going to recover data and click the "Download" button. And then in the pop-up window, you can choose the type of data you would like to download. 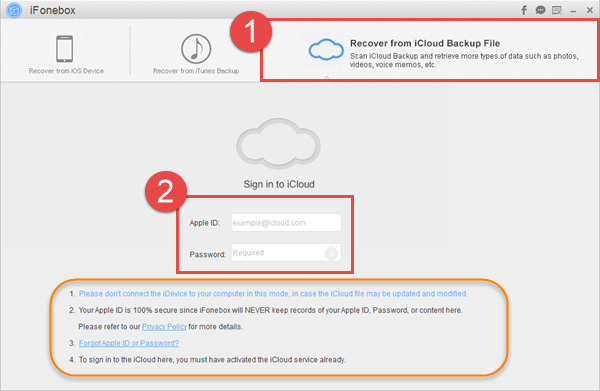 This will reduce the time of downloading iCloud backup file. 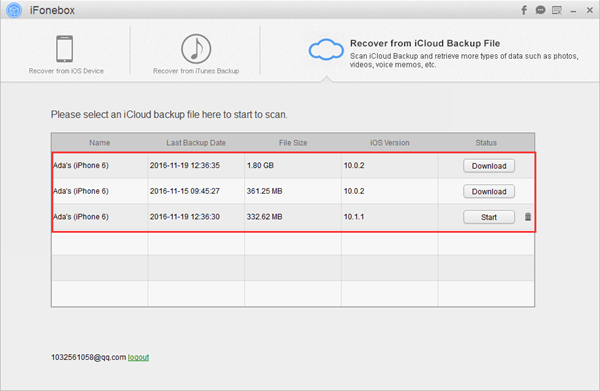 After that, you can scan the data included in the the iCloud backup. Click on the "Next" button to begin. It will take you some time. Just wait for a moment. After the scanning finishes, you can click the icon of the data you want to recover from your iCloud backup file, like contacts, messages, photos, whatsapp and more. Choose whatever you want from the exported items and then click on the "Recover to PC" to transfer them to your computer. Tips:iFonebox 2.1 for Mac is capable of transferring exported Notes, Contacts directly back to device. After the Notes or Contacts are exported, select the notes or contacts you need and click "Recover to Device" button on the interface to transfer these extracted Notes and Contacts directly back to your device. You can also do some modifications about the notes and contacts before transferring to your computer or device.